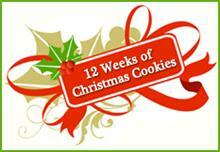 I look forward to visiting all the cookie blogs to check out this week's Christmas goodies when I return! Very cute and yummy too I bet. Also -I got my certificate!!! I can't wait to use it!!! That cookbook is beautiful. I'll have to check it out especially if it has more delicious recipes like your cookies in it. Your cookies are so pretty that they look like they belong in that cookbook too. These were my dad's favorite cookies, my mom always made them at Christmas. As a kid, I wasn't fond of them and i'm sure my dad didn't mind hoarding them all for himself. I need to try them again!! I love old fashioned molasses cookies. Frosting makes them just that much better!! Oh my heavens those look amazing!!!! Molasses cookies are the best. Yours are so pretty! Oh, how sweet! Thank you, Sue! My kids will love these. These look SO good. The minute I wrap up our Thanksgiving entertaining, I'm starting into Christmas cookies and anxious to try these. Yes, those cookies ARE Christmas! I am so ready for yummy cookies! (Luv Susan Branch too!) Enjoyed ur blog! I love molasses cookies but have never made them. Perfect with a hot cup of coffee! Beautiful cookies - so festive! I hope you had a wonderful trip! Your cookies look perfect! Molasses is such an under-used ingredient, so Bravo you for putting it to such delicious use! Wow, your molasses cookies look wonderful, and completely perfect for the holiday season! Wonderful job! These look so beautiful and the way you decribe them I can almost taste it in my mouth! And yes,the way that recipe is writeen is wonderful! Oooh I have Susan's book. I LOVE it. I have her Christmas one too. Your cookies just look so pretty and inviting! ooh I posted a molasses chew cookie which I really love but yours is so different than mine. A perfect holiday cookie! Love the icing which I can so see balances out the molasses tang. Beautiful! So cute indeed. I love molasses cookies, definitely need to give these a try. I love Susan Branch cookbooks! They are absolutely charming beyond belief. I haven't tried this cookie recipe yet but I'm bookmarking it right now! I love the glaze on them! These look very festive!! Enjoy your weekend! I have an award for you on my blog. I hope you will accept as you so deserve it! That recipe is adorable , did u write it or is it a book? If a book , which one? Super cute and so are ur cookies , very very pretty!!! I remember u liked my cookies too and need ur vote for them , will u vote please , will give details in the next comment! and post on ur wall too , if u can :-),voting ends in a day or 2! here are the details will be so gratefull for this!! if i make it it will only be coz of u guys! They look so pretty. Wish I had one right now. Hope you had a great long weekend. Molasses cookies definitely scream Autumn, and bring back memories of my youth, but they're going to be perfect for Christmas too! Thannnk u for ur Prompt reply though u were outa town!! By eye candy ,is it the beautiful art work or are there pics in there too? i have some molasses too and wanna bake some crispies! THats one charming recipe all right.And very charming cookies as well. I love the coloured sugar! Susan Branch always does such a nice job on her recipes- this one looks like it follows the regular pattern. Molasses just screams this time of year!